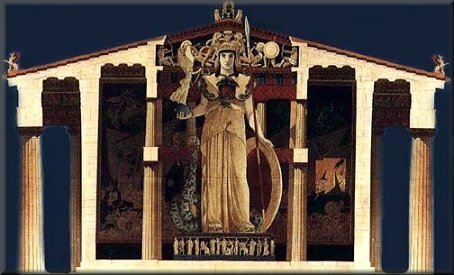 Besides, I was born in Athens, the capital city of Greece that was named after goddess Athena, so I'm partial to my patroness goddess. Stand warned - I've tried to stay true to the original myths, but sometimes I have a hard time extracting my tongue from my cheek...this is satire, after all, and I do like to have fun. My great-aunt Athena was the Greek goddess of wisdom, war, the arts, industry, justice and skill. Out of all the kids, she was the favourite child of Zeus, even though being present at her birth gave him a real migraine...You see, she had sprung fully grown out of her father's head! Her "mother" was Metis, goddess of wisdom and Zeus' first wife. Many claim that Athena had no mother, and that she was the daughter of Zeus alone, having sprung from his head. Nit-pickers! Either way, papa Zeus adored her. "I don't care if he is an Immortal, there's no way she pops out'ta his head, shield, spear and all, and he doesn't even get a scratch. Do you really expect anyone to believe that, Hessiod? We'll be the laughing stock of Greece!" 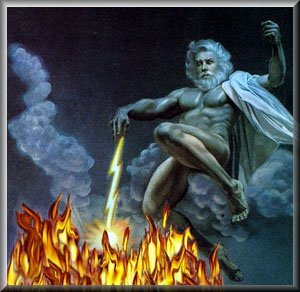 Zeus was always paranoid, especially the first couple of thousand years, when he was young. After all, he became King of the twelve gods of Mount Olympus by dethroning his father Cronus, and constantly worried that the same fate might befall him. In fear that Metis would bear a son mightier than himself, Zeus swallowed her. Nice guy. What's for dessert? Skilled Hephaestus, the god of smiths and fire, ran to his father and split his skull open with an axe to relieve his pain. Drastic, to say the least, but highly effective - The Mount Olympus drugstore was closed, after all. Those ancient Greek gods were a real hoot, I'm here to tell you. Good thing they were immortal. Don't try this at home, stick to aspirin. I heard on grandpa Hessiod's knee that Athena was born equal to her father in strength and wisdom. She was my favorite aunt, by far. Athena and her uncle Poseidon - brother of Zeus and the god of the sea, he always brought some great shrimp whenever he came to visit us - were both very fond of a certain city in Greece. Both of them claimed the city (as if there wasn't enough land to go around, but you know us Greeks...) and it was decided that the one that could give the finest gift should have it. Leading a procession of citizens, the two gods mounted the Acropolis. I couldn't believe the size of the throng. Ancient pickpockets had a field day, three denizens got busted for scalping tickets, and my cousin Dionysus, the god of wine, was arrested for drunken and lascivious conduct. As his gift, Poseidon struck the side of the cliff with his trident and a spring welled up. Not too shabby, as far as godly deeds go, but Poseidon wasn't thinking. The people marveled, but sadly the water was as salty as Poseidon's sea and it was not very useful. Bummer. Hate when that happens. Wise Athena's gift was an olive tree, which was better because it gave the people food, oil and wood. It also permitted the good folks at Thanasi's Olympus Greek Restaurant to serve the best Greek salad this side of Athens, which is what Athena named her city. 'In all things,' she said, 'my heart leans towards men, except in marriage.' She was a warrior (areia), powerful (stenias), and a champion (promachos). At the Acropolis, the cultural centre of Athens, the adoring people built a magnificent temple, the Parthenon ("virgin" in Greek), as a crowning jewel to honor her. I loved climbing up the huge statue bearing her likeness which greeted all visitors. She never got mad at me, or told me to stop. What a great aunt! Did I mention that Poseidon wasn't the best of sports? His temper was almost as legendary as that of his brother Zeus. In his anger over the choice of Athena's gift over his own, Poseidon as a parting gesture flooded the Attic Plain, which included Athens. Poseidon is another of my favourite uncles, but sometimes he could be a real chump! Happy ending, praise be to the twelve gods - Eventually, Athena and Poseidon worked out their differences (assisted by a case of cousin Danny's wine down at Thanasi's Olympus, vile gossip has it, but I'm not saying) and produced great inventions by combining their powers. Even though Poseidon was the god of horses, Athena built the first horse bridle and chariot (The famous Model-A, available in every color as long as it was black. I remember whizzing around on the prototype, with my aunt screaming at me to do up my seatbelt. That was fun!) Athena also built the first ship to sail on the sea over which Poseidon ruled, and we'd often go fishing in her personal galleon. Athena's interests and skills were manifold. Besides the chariot, bridle and ship, she is also credited with having invented the trumpet, flute, earthen pot, plow, rake and ox yoke, and she was the first to teach the science of numbers. What a woman! Make that superwoman. Athena also was the patroness of the "womanly arts", including cooking, weaving and spinning. There was nothing auntie couldn't do, I tell you. Speaking of spinning a tale, let me tell you how my great-aunt once punished a disrespectful woman. There lived on earth a mortal named Arachne, a maiden so skilled in the arts of weaving and embroidery that the nymphs themselves would gather and gaze upon her work. It was not only beautiful when it was done, but beautiful also in the doing. When people complimented Arachne and asked if Athena herself had taught her, she would deny this, for she was so vain she could not bear to be thought a pupil even of a goddess. "Let Athena try her skill with mine!" she would say. "If beaten, I will pay the price." Athena was displeased when she heard this impudence. Assuming the form of an old woman, she went and gave Arachne some friendly advice to respect the gods. Arachne would have none of it, telling the old woman to be gone. That's when my great-aunt dropped her disguise and revealed her identity. All the nymphs and bystanders bent low in reverence and paid homage to the great Athena, but Arachne was unmoved. "Well, it's a beautiful day here at the old weaving grounds, ladies and gentlemen, glad you could join us. Our contestants have taken their station and attached the web to the beam. Look how effortlessly the slender shuttle is passed in and out among the threads. "Oh my, the reed with its fine teeth strikes up the woof into its place and compacts the web! What a great move by Arachne! Phobia is a word foreign to her, beyond doubt! Such fearless speed, ladies and gentlemen, the skillful hands of both contestants move so rapidly, and the excitement of the contest makes the labour light. "Wow, did you just see that superb play by Athena? She contrasted Wool of Tyrian dye with that of other colors, shaded off into one another so adroitly that the joining deceives the eye! I can't believe what I'm seeing here, folks! These two brave women truly are the best of the best. We've got ourselves a real match!" Thanks, Ernie, I'll take over for the next inning. Athena wove on her web the great scene of her contest with Poseidon over the city of Athens. She made sure to insert in the four corners incidents illustrating the displeasure of gods at such presumptuous mortals as had dared to contend with them. 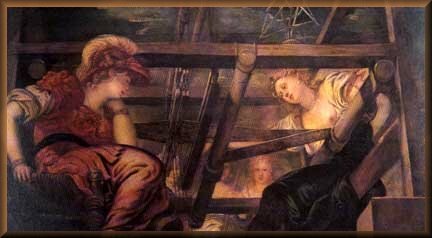 She meant these as warnings to Arachne to give up the contest before it was too late. As if to further spotlight her impudence, talented Arachne filled her web with subjects deliberately chosen to exhibit the failings and follies of the gods. Take over, Ernie. "Arachne is weaving the scene where Zeus deceives Europa under the disguise of a bull. 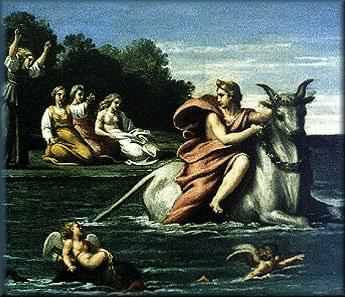 Encouraged by the tameness of the beast, Europa has ventured to mount his back, whereupon Zeus swam off with her to Crete. You'd think it was a real bull, ladies and gentlemen, so natural is the water in which it swims. Europa gazes with longing eyes back upon the shore she is leaving, and seems to be calling to her companions for help. "Look at the terror as she shudders at the sight of the heaving waves, and the way she draws back her feet from the water." Nice call as always, Ernie. Arachne filled her canvas with similar subjects, wonderfully well done, but marking her presumption and impiety. Athena finally had enough. She shred Arachne's web with her shuttle, and touched the woman on the forehead, making her feel her guilt and shame. Arachne could not endure the realization of her arrogance, and proceeded to hang herself. Athena felt pity for the hanging Arachne. "Live, guilty woman," she said. "But that you may preserve the memory of this lesson, continue to hang, both you and your descendants, to all future time." With that, Athena transformed Arachne into a spider, and to this day she hangs, testament to vanity. Sometimes Athena is referred to as Pallas Athena. Pallas was Athena's best friend, the two were inseparable, and she would often spar with her, honing her warrior skills. During one such sparring session, Athena mortally wounded her best friend. I'm sure it's happened to you. To honour her dead friend Pallas, Athena took on her name as part of hers. When Athena's warlike aspect was most prominent she was often referred to as Pallas. As the goddess of war, she was responsible for determining the fates of individuals engaged in combat. She received no pleasure from battle and could be merciful; in fact, she often sought peaceful solutions to potentially violent situations. Athena railed against excesses in war or everyday life. She taught men to conquer their savage streak, to tame nature and become masters of the elements. Her adoring subjects called her "Queen of Heaven", the meaning of "Athena". But the Queen of Heaven was tough! Athena was the lone deity to stand her ground when Typhon attacked Olympus. Typhon was the largest, most dangerous, and most grotesque of all creatures. So frightening and intimidating was Typhon that when he rushed Mount Olympus all of the gods ran off to Egypt and hid themselves by assuming the forms of various animals. Bunch of sissies! Man, was that funny! Only Athena stood firm, and she shamed and goaded Zeus into action. Zeus struck Typhon with a thunderbolt and used Uranus' castrating sickle to wound the enormous creature. Typhon retreated to Mount Casius, where he and Zeus resumed their struggle. To make a long myth short, Typhon and Zeus began hurling mountains at one another, which resulted in Typhon being crushed beneath what is now known as Mount Aetna. Boys will be boys. Lots more on that when we get to my godfather Zeus. Athena's companion was the goddess of victory, Nike, who went on to sponsor a lucrative shoe company. Besides the obvious benefits of always having victory at your side, Athena liked hanging with Nike because she got to meet Michael Jordan and Tiger Woods, who were Nike's favorite mortals. I remember my aunt and Nike playing Mike and Tiger two-on-two and completely trouncing them, even though the boys did manage to score once. Tiger Woods: "Yo, Mike, what do you make of these 100-foot tall baskets, man? I thought they were supposed to be ten feet tall! This Mount Olympus court is something else!" Michael Jordan: "This is work, dude! Did you just see Nike dunk the biscuit like she was born in Brooklyn? And I hear the golf course here is an absolute monster!" There exist a myriad of myths involving Athena, and she helped many of the Greek superheroes attain their goals. Athena had a thing for superheroes, including Perseus, Jason, Cadmus, Odysseus and Heracles. She even personally went up to Mount Pelion to cut down the trees to build the Argonauts' boat...wait till I tell you about the Golden Fleece, it was a blast! The Queen of Heaven is usually portrayed holding her bird, the wise owl. 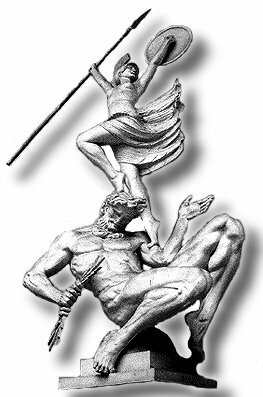 Athena also possessed the Aegis, which made her invincible. The Aegis was a protective device that was originally associated with Zeus, but also, and later solely, with Athena. It is variously considered to be a bright-edged thundercloud (because when Zeus used it lightning flashed and thunder sounded...he used to do it for no reason just to scare us kids whenever we visited) fashioned by Hephaestus, or the skin of the divine goat Amaltheia - it's a long story. It is a sort of cloak, sometimes covered with scales and fringed with serpents, and with the head of Medusa fastened in the middle. Yucky! Try wearing that for a couple of days! The Aegis could also serve as a shield and in that fashion Athena wears it upon her breastplate. Among all the gods of Mount Olympus, Zeus permitted only Athena full use of all his resources and weapons - including his devestating thunderbolts - attesting to the special fondness he held for his favourite daughter. She reciprocated by loyally aiding him on many causes dear to his heart, and often came to take sides in matters in which Zeus could not involve himself, even though he might have wished to. 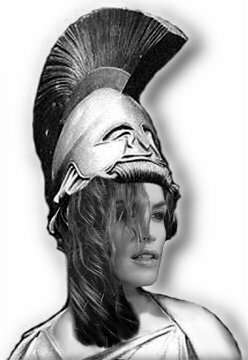 Athena's wisdom, beauty, pacific warrior skills and her countless contributions to gods and mortals place her among the elite of Olympus. The Queen of Heaven is the protagonist in many great myths, and the best great-aunt in the world. Those shameless Roman plagiarists called her Minerva, but she once told me that she hated that name. And all this time you thought Cindy Crawford was a goddess! By Hades, she couldn't even carry Athena's Aegis!